1.8 complete voice recitations of Holy Quran by Al-Afasy, Ajmi, Abdul Basit, Al-Meaqli and Ayyub. 3. 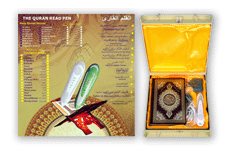 Complete Holy Quran Book in well printed Othmani font on precious paper with beautiful cover. 4. Read Pen can read any page, Sura or Aya by only touching the text in the Holy Qur'an Book. Learning disabilities or dyslexia to get immediate word support when they are reciting. 6. Perfect for those who want to learn how to Recite (Read) Holy Quran without a teacher especially for non-Arabic People. 7. With the help of Read Pen, children and adults can conveniently recite Holy Quran anywhere any time. 8. With this new breakthrough technology, the Recitation is easy & Holy Quran learning process is accelerated! Quran Read Pen hides a unique technology that scans and pronounces Quran Page / Sura / Aya from printed Quran. Quran Read Pen Improves reading skills for all learners -Maintains the flow of reading as students & non-Arabic people encounter unfamiliar words. Use the Quran Read Pen as your reading assistant anywhere, any time. This versatile device may improve Holy Quran Reciting skills dramatically. With the auditory support provided by the Quran Read pen, frustration and embarrassment disappear. We will supply you with the pen a transparent plastic film with invisible code. Hat means, one Read Pen can read any Quran of different size.